One of the best ways we can prepare our children as they go back to school is by praying for them. I recently wrote an article for iBelieve.com, on five prayers to pray for your kids as they make their way into a new school year. Moody Radio Quad Cities picked up the article from Crosswalk.com, and asked if I would share about this topic on air. One of the first questions they asked was what prompted me to write this piece. First, this Back to School season tends to evoke a variety of emotions, for both parents and children – emotions of excitement as well as anxiety. When we’re happy and thankful, and when we’re anxious and scared, we’re called to pray to our Heavenly Father. Secondly, for many parents, the standard, default prayer is that God would protect our children. By that, we often mean that He would protect them from physical harm. While that’s a good and noble request that we should continue to make, we often neglect to ask the Lord to protect our children spiritually – an aspect that is just as important, if not more important, than their physical well-being. Sometimes we underestimate what the Lord is capable of doing in and through our children. We’re quick to pray for material needs, but not as quick to pray that God would use our kids as a powerful influence in His kingdom and for His glory. We’re nearing another changing of seasons. Summer is winding down, and a new school year is beginning – just like it did last year, and the year before. Through this predictable repetition in our calendar and Your creation, we see Your faithfulness. Help us to look at the sunrise and remember that You always keep Your promises. As we approach another transition sending our kids back to school, conflicting emotions wrestle within us. New fears jostle with new hopes. We’re happy to send our children back to the classroom, and sad to see them go. We delight in their excitement, and worry with them over the unknown. Calm our hearts, Lord, and give us a peace that passes understanding. Remind us, Lord, to commit our children to prayer, each and every day. 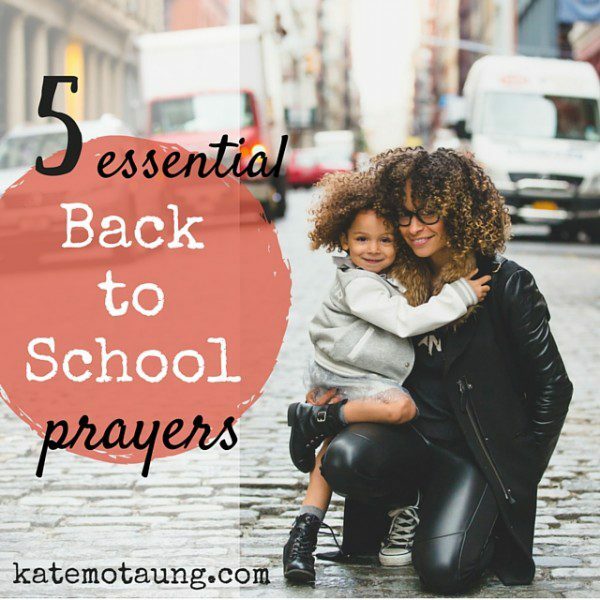 For the remainder of this article and to find out which prayers are essential to pray for your children as they head back to school, click here.